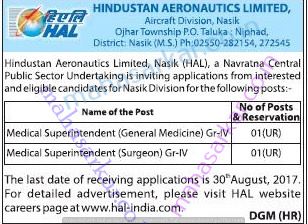 HAL (Hindustan Aeronautics Limited), Nashik Published Job Notification for 02 Medical Superintendent Posts. Candidates who wish to apply must look at HAL Recruitment 2017. Eligible candidates can apply offline before 31st August 2017. Posts Name Medical Superintendent (General Medicine). Medical Superintendent (General Medicine) – Candidates possessing MBBS + PG Degree/DNB should have at least three years’ relevant experience at a renowned Hospital/Organization/Institute in the concerned specialty, after acquiring the Post-Graduate Degree. Medical Superintendent (Surgeon)-Candidates possessing MBBS + PG Diploma should have at least four years’ relevant experience at a renowned Hospital/Organization/Institute in the concerned specialty after acquiring the Post Graduate Diploma. Interested & Eligible candidates can send their application along with all the necessary documents and testimonials to Senior Manager (Human Resources), Hindustan Aeronautics Limited, Aircraft Division, Nasik Ojhar Township Post Office,Tal- Niphad, Dist. Nasik – 422207. Starting Date, Last Date to Apply Offline at Hindustan Aeronautics Limited which candidates should be remember as follows. Start Date to Apply Offline: 02-12-2017. Last Date to Apply Offline: 02-04-2017.